When you are carrying a bundle of joy there are so many things that are likely going through your mind. You have to choose a name, paint the nursery, purchase the right items for his comfort, and take parenting classes to make sure you are prepared. One thing you might overlook is the need to go to the dentist. This is not something to be overlooked though - seeing us regularly throughout your pregnancy is not only crucial for your own health, but the health of your baby too. Do you suffer from morning sickness? If so, believe it or not, you are weakening your teeth every time you get sick. The acids that come up into your mouth with your vomit eat away at the enamel on your teeth. The more your enamel is damaged, the weaker your teeth become, which means the more susceptible to tooth decay they become. In order to prevent this from occurring, visit us early on in your pregnancy. If you cannot handle anyone being near your mouth in the beginning, make sure to make an appointment as soon as your morning sickness subsides to ensure that your teeth did not suffer any damage. 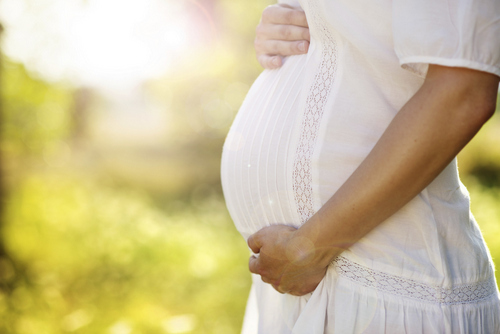 Gum disease occurs for a variety of reasons during pregnancy. There is pregnancy gingivitis, which occurs as a result of the increased hormones throughout your body that cause more blood to be rushed to the gum tissues, which naturally makes them swollen and tender. These same hormones are responsible for decreasing your body's ability to fight bacteria, which could lead to a greater amount of plaque in your mouth. In addition, there is the increased eating that a pregnant person typically does just because she is eating for two! We all know that pregnancy cravings are not typically fruits and vegetables, they could be anything including starchy and sugar filled snacks. This means that you are at a higher risk of having food debris stuck in your mouth, which leads to bacteria and plaque, which leads to subsequent gum disease. As a precaution, it is always a good idea to have your oral health checked at least once during your pregnancy. This allows us to ensure that everything is moving along as it should and that you are not prone to pregnancy tumors, which even though the name sounds scary, they are not cancerous, but could be troublesome if they interfere with your comfort or make it difficult to eat. It is a good idea to visit us as early in your pregnancy as possible and then at least one more time before you have the baby. This gives us a chance to see your mouth in the beginning when your hormones are likely very difficult to manage and then again later on. We will be able to see if anything has changed in your mouth, if you are subject to tooth decay, or if you are experiencing any type of gingivitis. The earlier that you receive treatment for any dental health issues that you may be experiencing, the quicker we can help to manage your oral health. You want your oral health to be in optimal shape for yourself and for the baby that is growing inside you! If you are pregnant, please call us today to schedule an appointment for a cleaning and checkup. We will give you advice on how to best manage your oral health care during the next nine months as you anxious await the arrival of your new baby!